Christmas eats more often than not come with a background of prep, stress and angst. Rather than try to uphold traditions we've focused on a few high-meets-low Christmas snacks – the type that are more concerned with spectacular eating rather than any kind of preconceived notions of what 'should' be served at Christmas. Festive drinks and a few of these and you'll have the festivities sorted. Yup. You read right. 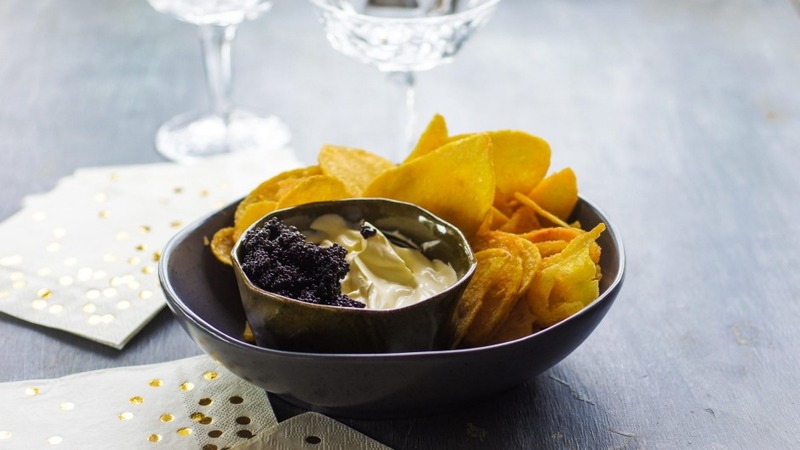 Grab yourself a packet (or six) of sea salt Kettle chips, add 1 to 2 tablespoons of champagne to a punnet of creme fraiche and serve alongside about 60g or so of caviar. If you really want to take it up a notch you could add 1 tablespoon each of very finely chopped flat leaf parsley and dill to the creme fraiche dip. Combine a packet each of mixed nuts, pretzels and popcorn in a large bowl. Go large and add any savoury snack you like, even some honey-flake-style cereal is a great addition. Add about 3 to 4 tablespoons of room temperature duck fat and stir gently to coat. Mix in a pinch each of paprika, cumin and cayenne pepper. Spread out on a baking tray and pop in the oven at 170C for 10 minutes or so until crisp. Toss the mix every few minutes for even cooking and keep an eye on it to ensure it doesn't dry out and burn. Melt a decent slice of Buche d'Affinois or grated hard sheep's milk cheese such as pecorino on slices of sourdough under the grill. Top each with ripe peach slice and sprinkle over a few coriander leaves and finely sliced fresh jalapeno. The end. Hard boil 6 to 8 eggs, peel, slice lengthwise and scoop out the yolks into a bowl, reserving the eggwhite halves. Add about 4 to 5 tablespoons Kewpie mayo, 4 tablespoons drained, finely chopped kimchi and a few slices of spring onion to the yolks and mix to combine. Spoon the mixture back into the hollows of the cooked eggwhite halves, sprinkle each with a few black sesame seeds and some furikake seasoning and consider it snack done. Mix softened butter with finely chopped tarragon and a dollop of hot sauce. Top oysters with about a teaspoon of the butter then pop under a grill until the butter melts like glorious pools in the shells. This is a riff on Wolfgang Puck's famous pizza, with the addition of lemon zest and red onion. Cook some fresh pizza bases in the oven until crisp. Spread with hefty amounts of creme fraiche then add about 2 tablespoons very finely chopped red onion. Layer over slices of smoked salmon, scatter with dill fronds and finely grate over some lemon zest. 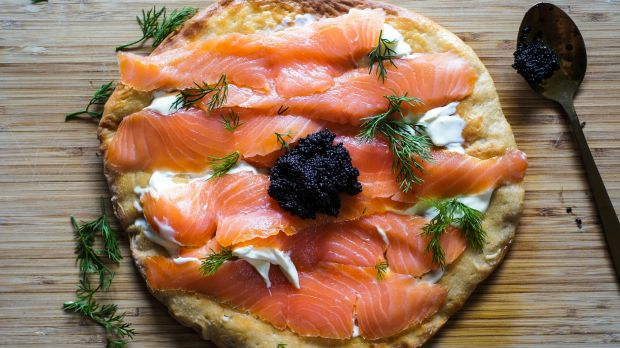 Place a hefty dollop of caviar in the centre (optional), season with salt and pepper and serve. Douse some mixed, unpitted olives with a few hefty swigs of botanical gin, add a few thick strips of lemon zest and pop under the grill until just warm. Glorious. Easy. Take beer snacks to the next level by steaming about 500 grams of edamame. Turn out into a bowl and add 2 tablespoons fried shallots, the zest and juice of 1 lime, 1 tablespoon olive oil, 1 teaspoon castor sugar and 1 tablespoon cayenne pepper. Stir to coat for spicy finger-licking goodness. Halve a soft bakery focaccia lengthways. Butter one half then sprinkle with 1 tablespoon garlic flakes, ¾ cup grated parmesan cheese and 1 tablespoon chilli flakes. Sandwich and pop in an 180C oven until toasted and the cheese has melted (about 15 minutes). Slice into generous fingers and serve with quality store-bought marinara sauce for dipping. Fill some mini brioche hotdog rolls with chunky peanut butter and layer with crisp slices of pancetta or bacon. Salt, fat, sweet and soft: what all four-cocktails-in snacks need.